The Garden Route lived up to its name as we headed towards Plettenburg Bay, it really is very scenic and green. It didn’t take us long to reach Plett and we soon located Nothando Backpackers. Now backpackers seems to have a different connotation than in Asia and Nathandos provided super clean en-suite rooms with free wifi for a very good price of R430 a room. You can order breakfast or there is a kitchen to make your own grub. Apparently Plett gets chokka in the summer but off season we found it to be a pleasant place, a bit like St Francis without the thatch roofs. We had a wander along the coast and down to the beautiful beach in the hope of spotting some whales or dolphins but our luck was out today. The next day our mission was to do a coastal walk and enjoy the shoreline along this section of the Garden Route. Robberg Nature Reserve looked like just the ticket even though we didn’t think we would be able to use our wildcard. In the end it was just as well we had popped the park pass in our pocket as entry was gratis with it. The entrance fee without the card was only R40 but every little helps. 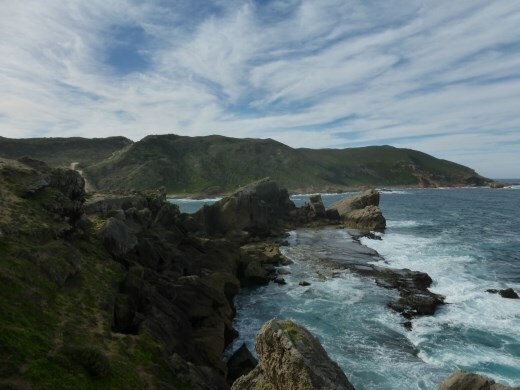 Robberg is a peninsular close to Plett and it can be explored on foot via 3 trails of varying distance. We intended to make the most of our visit so chose to do the longest track which circumnavigates the entire reserve. The views along the way were simply stunning with rocky cliffs, pounding surf and turquoise seas, dense green bush speckled with brightly coloured flowers and exquisite sandy beaches merging into a huge sand dune. The paths are all well signposted and as in all the parks we were given a map and information. South Africa really does know how to cater for anyone and everyone who loves the great outdoors. We’d been informed that the full round trip would take about 4 hours but it soon became clear that it would take us longer. No not because we are old and slow or that the terrain is tricky to navigate but because we kept stopping to admire the scenery. Plus, of course we spent time observing any creatures that we encountered. In fact, it didn’t take long to start spotting some wildlife and the first sighting was a couple of southern right whales – an auspicious start indeed! By the end of the walk which took us about 4 and a half hours we managed to glimpse whales on 5 separate occasions. Granted at times we only saw the spray from their blowhole but it was very exciting. When we reached the very tip of the peninsular we took a short break watching the numerous sea birds when something in the swell caught our eye – dolphins, a huge school of dolphins, brilliant. The animal we saw in greatest number was the cape fur seal. They were everywhere, resting on rocks, playing in the waves and leaping out of the ocean or floating around on their backs grooming themselves. We must have seen about 500 and they certainly have a great place to live. On also saw rock hyrax in 2 locations, one group was quite wary but the second were intent on warming up in the sun and didn’t seem bothered by our presence. We were also lucky enough to see a couple of grey mongoose, a skink and a couple of lizards. Obviously there were lots of birds fluttering around too with cormorants and gulls being the most common. A fabulous walk and a grand day out all round. We ended the day with another potter around Plett and found ourselves drawn to the shore again. We found another backpackers that was in a prime spot right on the beach with lovely ocean views. So we did the only thing possible and we popped in for a beer! As sunset was approaching another school of dolphins skimmed along the inshore waves. A fantastic finale to an amazing day.